The Great Outdoors Cool Hat gives you the best protection from the sun this summer. The Great Outdoors Cool Hat gives you the best protection from the sun this summer. Not all breathable hats have UV protection, but Cool Hats with a magic Cool Pad won’t let harmful UV rays pass through the fabric fibres, whilst still providing full Air Flo to your crown. Comfy and cool, with a convenient Tuckaway Neck Protector for added protection, this will be your favourite hat. 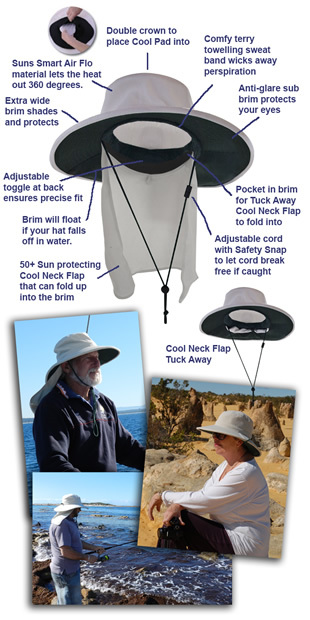 Whether camping, bushwalking, line dancing, fishing, canoeing, running, horse riding, kicking back by the pool, golfing, playing tennis, lawn bowls or cricket, cycling, lawn mowing or doing anything that takes you outdoors, you will be reaching for your Great Outdoors Cool Hat with Magic Cool Pad. The Great Outdoors Cool Hat is the perfect choice for anyone to enjoy the great outdoors ! This Australian designed hat protects you in a number of vital ways. Wide brim to protect your face yet keep your vision unhindered. Wide brim that will float if dropped into water. The Cool Flap fits discreetly into the rear portion of the brim. To fully protect yourself from the sun, the Tuck Away Cool Flap unrolls and loosely drapes over your neck to protect all angles of the neck. The Airflo mesh in the crown enhances coolness and comfort during hot days or strenuous activities. The Cool Flap acts like a vented veil to provide added air flow whilst still delivering full sun protection. But it can be tucked away until you want to use it. Throw your Great Outdoors Cool Hat into the washing machine.